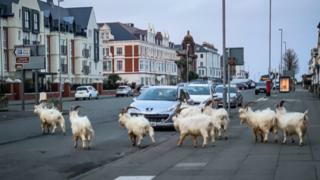 Some of the wild herd of 122 Kashmiri goats on the Great Orme in Llandudno have wandered into the town. They have been spotted holding up traffic and nibbling flowers in people's gardens. Conwy council said: "Generally it is at this time of year that the goats come down to much lower ground because of the bad wet weather." Llandudno residents said this was the furthest the herd had ventured into the town. Image caption How are you getting down from there? Image caption Did someone say all you can eat? Gillian Townsend, 38, caught the animals holding up traffic and munching on flowers in a garden on Monday. "It was quite funny, they decided to herd into the middle of the road, stopping a car and a taxi, then started galloping up Lloyd Street," she said. Alison Rowlands said although she had seen the goats come down the west shore in previous years, this was "the furthest into town" she had seen them. The 48-year-old Llandudno resident said that they liked to eat bushes and garden foliage. A Conwy council spokesperson said the authority was not directly responsible because Great Orme goats are wild animals, although it manages the country park where they live. But they added that any land owner has a direct duty for the animals' welfare if they are found on their land.